With the current surgical atmosphere emphasizing avoidance of ectasia at all costs, some refractive surgeons may be surprised to hear that LASIK is being performed specifically on corneas that aren’t very thick or that have unusual topographies. Athens, Greece, surgeon John Kanellopoulos says he’s been performing the procedure, accompanied by corneal crosslinking, on such eyes for two years in an effort to make the procedure safer in these patients. Here’s a look at Dr. Kanellopoulos’ work so far and other surgeons’ reactions to it. Dr. Kanellopoulos says performing LASIK on eyes he describes as “high-risk” wasn’t a decision that was made overnight, but instead came as the result of an evolution of his use of corneal crosslinking with riboflavin and UV light. When Dr. Kanellopoulos refers to a high-risk LASIK patient, he means eyes in which the initial corneal thickness isn’t optimal. “This would be where someone is starting with a corneal thickness of 500 µm,” he says. He says it might also be a patient who, regardless of his initial corneal thickness, is going to undergo a significant amount of myopic correction accompanied by a significant amount of tissue removal, such as a -8 D myope with a 510 µm preop corneal thickness. “I think this would be anyone who has funny-looking topography in which there’s any question of posterior corneal elevation or an irregularity on surface topography and we conclude it’s not forme fruste keratoconus,” explains Dr. Kanellopoulos. 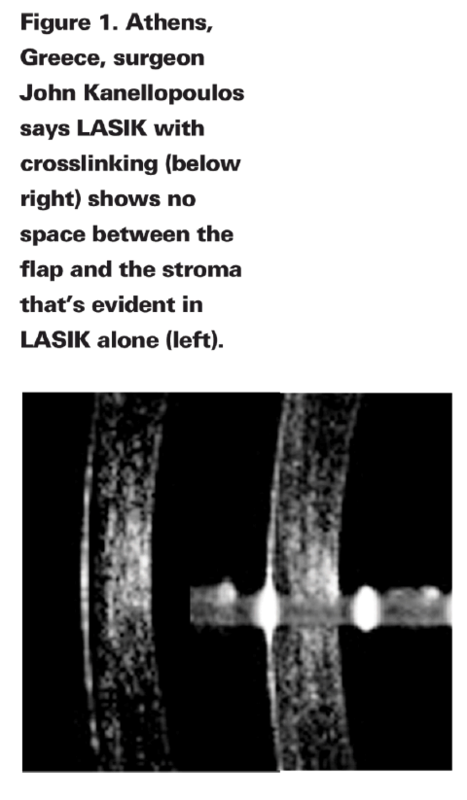 He draws the line, however, at performing LASIK on corneas under 480 µm in minimal thickness. The prophylactic treatment is about half of a standard crosslinking treatment, says Dr. Kanellopoulos. After the flap has been made with the IntraLase laser and the cornea ablated, he puts several drops of riboflavin directly onto the ablated stromal bed and the backside of the flap. Flap thicknesses vary between 100 and 120 µm. He waits a few seconds for the agent to be absorbed, and then lays the flap back onto the bed without pushing the fluid out. He waits another 15 to 20 seconds. “Within seconds, the flap is colored yellow, indicating the riboflavin has penetrated the totality of the flap and has soaked some of the underlying stroma,” he says. At that point, he irradiates the cornea for 15 minutes with the standard crosslinking energy dose of 370 nm UV light with a fluence of 3 mW/cm2. In a study of his technique that he presented at last year’s AAO meeting, he presented data on 25 cases. The average follow-up was 1.5 years (range: one to three years). The spherical equivalent of the patients was reduced from an average of -7.5 to -0.2 D, and the average K reading went from 44.5 D to 38 D. The average flap thickness was 105 µm, and the average corneal thickness was reduced from 525 µm to 405 µm. The mean endothelial cell count went from 2,750 to 2,800. Dr. Kanellopoulos says the corneas are currently stable. Since Dr. Kanellopoulos’ study involves high-risk LASIK eyes, surgeons familiar with crosslinking have varying opinions on the treatment. “[Questioning LASIK in such eyes] is a valid criticism,” says the Cleveland Clinic’s director of refractive surgery and crosslinking researcher, Ronald Krueger. “A surgeon might say, ‘Wait a minute, you’re taking a higher-risk patient that we’d normally be canceling out of possibly treating and treating him?’ Such an investigation might be viewed as experimentation and some might think it shouldn’t be done. But, if you’re in a place where you really want to do something to help a patient and, at least on a limited investigational basis want to do a series of patients that are fully informed, you might be able to justify that this can be done as long as you follow proper protocols. It might need institutional review board approval or something along those lines. Some surgeons may question why LASIK is even necessary, when another procedure might do, instead. “Based on the study of the technique, we know these are high myopes to begin with, with an average preop sphere of -7.5 D,” says Los Angeles surgeon Brian Boxer Wachler. “If you have a high myope to begin with, we know that doing a phakic intraocular lens is going to provide a higher quality of vision than LASIK for high myopia, so why not use one?” Other surgeons might recommend a PRK as an alternative. Copyright© 2000 - 2009 Jobson Medical Information LLC unless otherwise noted.